The ‘buzzard attack’ incident happened on a walk from the village of Nether Kellet back home to Silverdale. 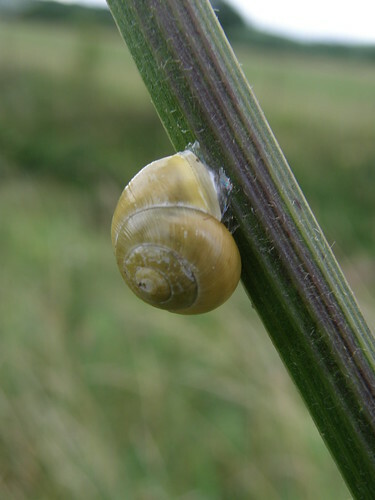 The walk was packed with incident, but otherwise of a low key nature and not offering any threat to life and limb, apart from the frequent nettle stings. Nether Kellet was selected as a start point from convenience – the kids were there for a birthday party so a lift was on offer. (TBH was driving, even on the quieter country lanes it’s considered bad form to let children under seven drive). 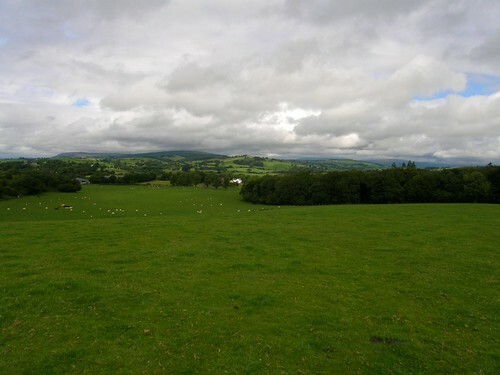 The journey home began inauspiciously in a shower – it was that sort of day: lot’s of cloud, some sunny spells, some showers – of which the first was the worst. As soon as it stopped and I pulled down my hood there were plenty of things to see. 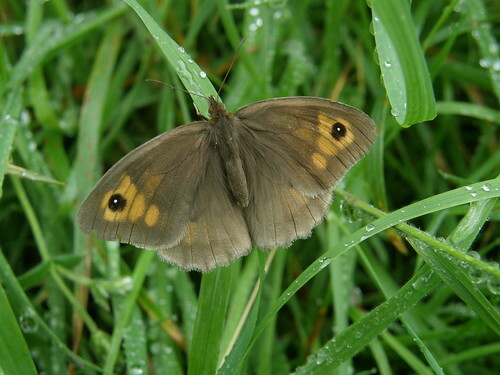 Whilst I was trying to find the best position to capture this obliging meadow brown, a day-flying micro-moth decided to muscle in on the action, landing on an adjacent grass-stem. 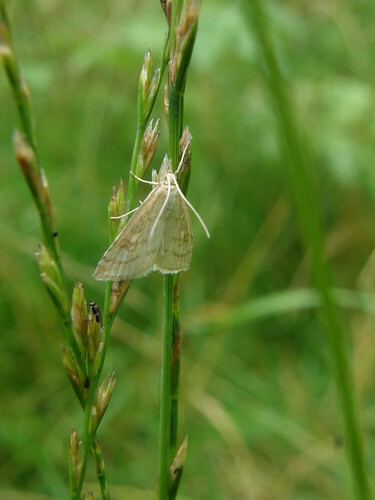 I have no idea what it is – my ‘Complete British Insects’ has only two pages to cover micro moths. I need a moth guide. Can’t find these little critters in my book either. 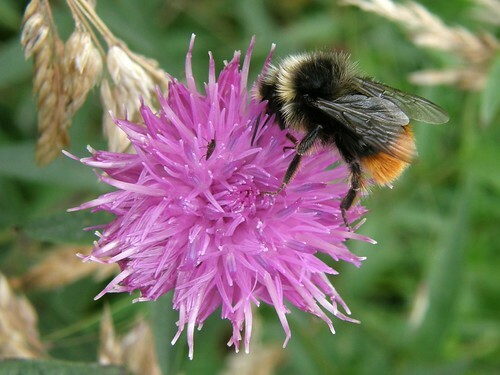 I saw no end of them, mostly on umbellifers and mostly multiplying with gusto. 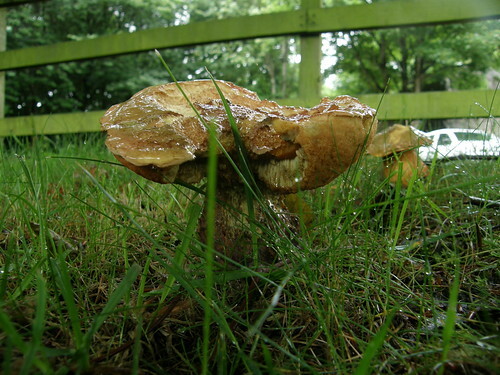 Do they like damp days or is it just a coincidence that that’s when I seem to notice them? 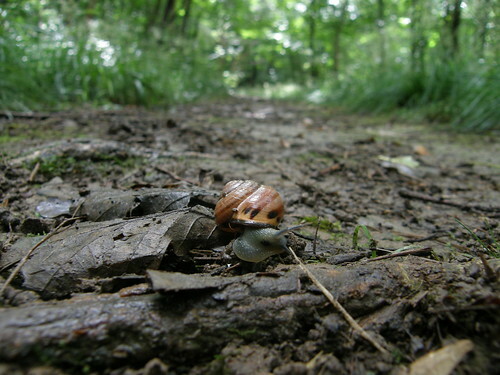 Slugs and snails certainly like damp days and both were out in force on paths and plants. Between Nether Kellet and Over Kellet my map (an old green pathfinder 1:25000) showed the path toeing a delicate line between two large quarries. The path doesn’t actually do that anymore, but sadly I didn’t realise that at first and spent a good deal of time wandering backwards and forwards wondering where I was. Probably I was distracted by a fine collection of fungi by the car-park of the quarry companies offices (that’s my excuse anyway). Eventually, when I realised what had happened I decided to follow the road into Over Kellet. It was on the rather fine path heading from Over Kellet towards Capenwray (which I’m pretty sure I’ve never walked before) that I had my one-sided altercation with an aggressive buzzard. This is the view from the top of the rise just beyond the copse where I assume the buzzards were nesting. The woodland on the right is a mixture of native species and seemingly several types of conifers – it looked almost like an arboretum, it would be interesting to know it’s history. The valley behind that wood is presumably where the Keer rises, behind that the western edge of the Pennines lurk. On the left the noticeable edge is the steep western face of Farleton Fell. 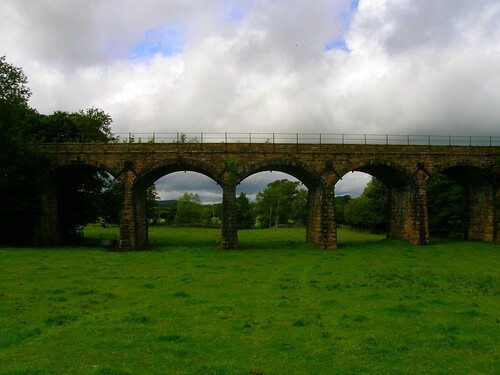 I passed Capenwray Old Hall Farm, crossed a bridge over the Lancaster Canal, then under a viaduct which I don’t remember from my previous trip this way…. ….and then turned left to follow the Keer. The Keer is a very small river – really just a stream with an over grown sense of it’s own importance. At first I was in the fields alongside the river – there are stiles over the fence giving access to the riverbank but there was no real evidence of a path. Where the river flowed under a road bridge the right-of-way crossed from one bank to the other and now I was right on the bank. Which was very overgrown. There was a path but nobody had told the nettles and grasses and brambles etc and they were doing their best to obliterate it. My calves and shins are beginning to itch just with the memory of the nettle rash inflicted on them. There were compensations however. 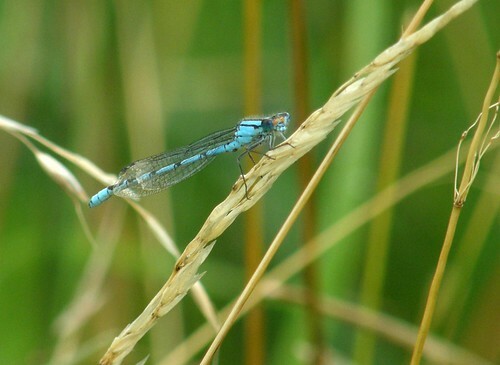 The air around me seemed to be constantly full of electric blue damselflies. They wouldn’t sit still for long and the autofocus on my camera doesn’t cope well with a complex background, but I’m reasonably happy with this photo at least. Having moaned about the nettles, I’m actually thinking that I’d like to go back to this stretch of the Keer in sunnier weather and in stout trousers rather than shorts, because there was a wealth of plant and insect life. 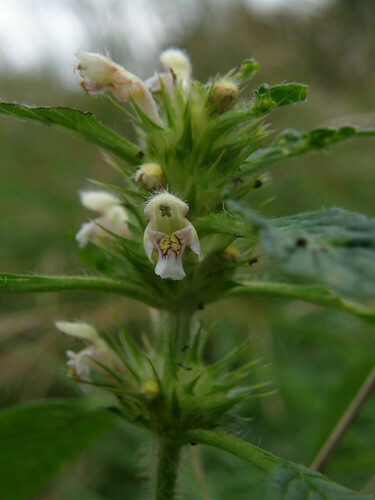 …is common hemp-nettle. Having stopped to photograph the flower, as is so often the case I then noticed something else of interest. 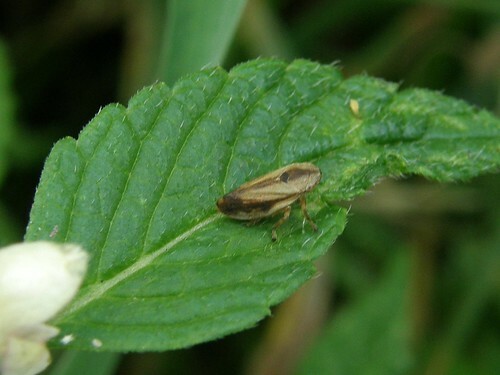 It seems to me that this tiny chap must be a froghopper – he does have a coiled and ready to spring look don’t you think? ….this tiny but stunning bug. 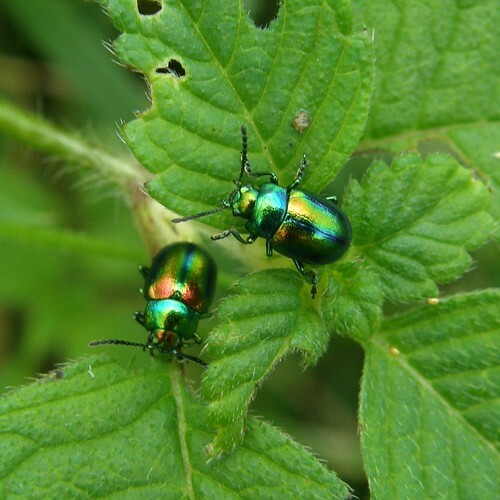 Chrysolina Menthastri I believe – “found mainly in waterside habitats”, “feeding on mint and other labiates”. 1. Having lips or liplike parts. a. Having or characterizing flowers with the corolla divided into two liplike parts, as in the snapdragon. b. Of or belonging to the mint family Labiatae. Aren’t search engines wonderful? 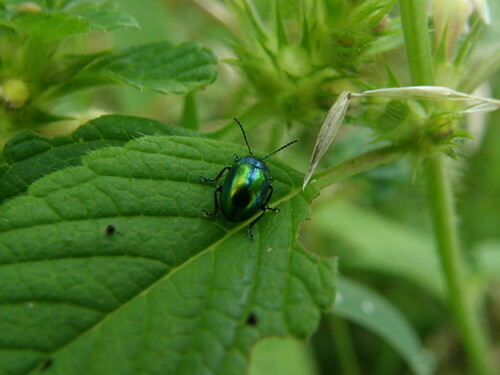 I think that Common Hemp Nettle is a labiate plant, so if I’m right about that and if I’m right about the plant being Common Hemp Nettle then I may have correctly identified the bug. They’re amazing whether they are Chrysolina Menthastri or not. It’s surprising that such striking insects don’t have a common name, or maybe that’s just my book – a quick search gives ‘Mint Leaf Beetle’ on several websites. Sadly the ‘path’ beside the Keer got slowly worse. To add insult to injury I didn’t see any kingfishers where I’ve seen them before – where the river flows under the motorway. By now I was well behind schedule and should have been at home roasting a chicken for the family tea. The walk became a bit of a route march in an attempt to get home reasonably quickly. From the A6 a track took me to Borwick Lane, I was quickly through Warton on the Coach Road and then over the shoulder of Warton Crag on the bridleway. At the start of Quaker’s Stang I was surprised by the farmer and his collie who had somehow managed to sneak up behind me on a quad-bike. I opened the gate for them and received a cheery “Same time t’mora” by way of thanks before they whizzed off across the Stang. 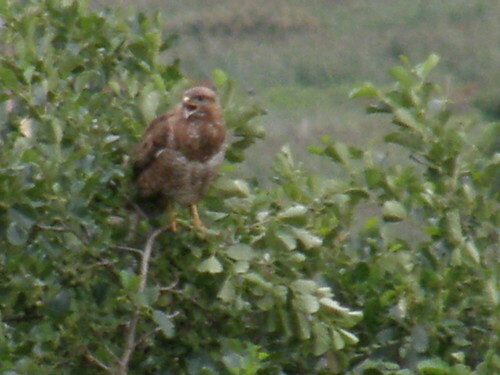 Another Buzzard was perched in the last of the hawthorns on the Stang, although I didn’t see it until it took off. I watched it land in an ash by a tall dead tree, knowing that my path would take me right under that tree. When I got there, the bird was still there. It released an impressive volley of droppings and then, calling stridently, flew off back over the salt-marsh. It landed on some trees below. I had to climb a little higher to get a vantage point from which I could see it, but I could hear it calling all the time. Alternating with the kew of the buzzard was a slightly higher, harsher sound which I assumed was the farmer whistling to his collie. She was a long way away (I decided that it was a female bird but without any justification for that assumption) so I tried using the digital zoom. Frankly, I’m surprised that the photo is even recognisable – with the maximum zoom I was finding it difficult to keep the bird in the viewfinder. She continued calling for quite some time – long after I had moved on I could still hear her, and was obviously agitated, but didn’t try to steal my hat for which I am very grateful – twice in one day and I might not have wanted to venture out again.